Stardust is an intergalactic journey that takes players across the farthest reaches of the galaxy in search of treasures that are quite literally out of this world. 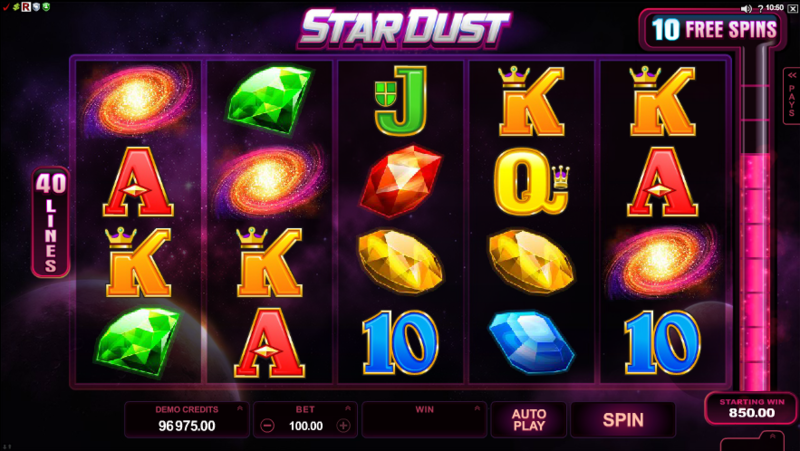 Stardust was developed by the online slot juggernaut Microgaming, and very much boasts a style that is reminiscent of the 1980’s and the obsession with futurism. This is a slot that is built for players of old who enjoy slots that have a slight theme to an otherwise cut and dry experience. Everything from soundtrack to symbols, this slot has it all in spades. Microgaming are a really big nat in the online slot industry, that should be reason alone for players to experience Stardust to begin with. 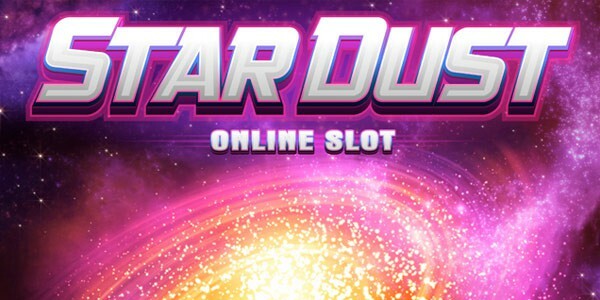 This is a 5 reel slot that has 40 pay-lines to help players in reaching towards the stars. Players who play Stardust can win up to 100,000 coins; a very generous jackpot indeed. 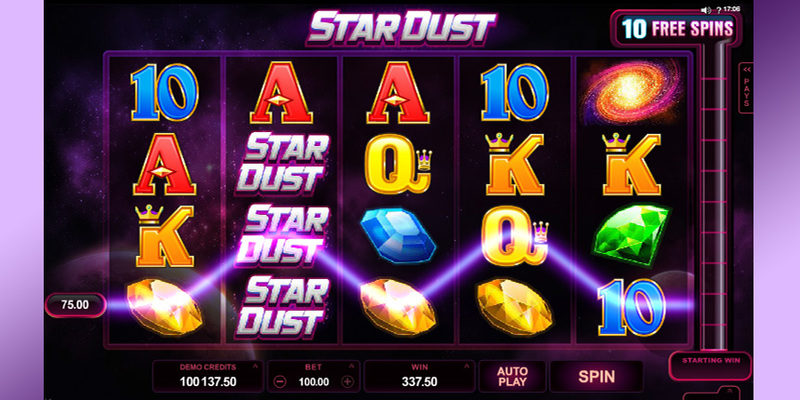 Stardust is chocked full of different symbols, all of which have a different numerical base value depending on how many of these symbols are included within the winning pay-line. Symbols are matched from left to right. There are low value symbols at play here, all of which are represented via playing cards. You’ll notice that there are a variety of different coloured gems on the reels also. The blue, red, green and yellow symbols you see are Stardust’s main attractions. Some of these symbols possess a hidden feature that can only be unlocked through playing. There are wilds and scatters here also to keep you on the edge of your seat. Free spins are also awarded to players who utilise scatters to the best of their ability. The Stardust symbol on the board offers something a little different also. Matching this symbol on the board will create a Stardust meter that will fill with every victory on the reels no matter how small. Once the meter is full then there is a very generous bonus waiting for players at the end of it all. This is a vintage slot so a lot of what you see is what you get, we should state that this isn’t a bad thing either. Less is more has never looked so good.